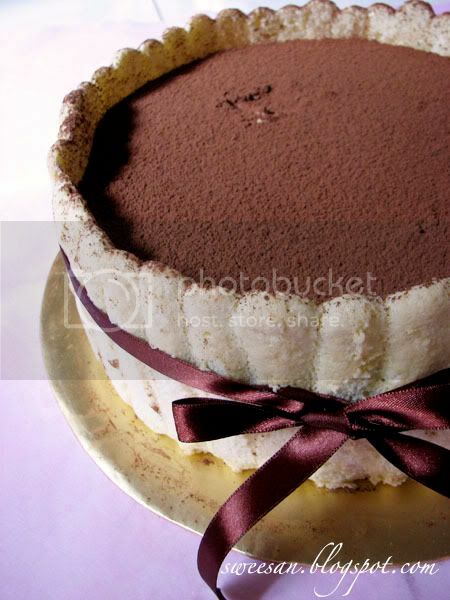 Everyone knows tiramisu and u get alot of versions of it (real or fake ones lol) Tiramisu is originally made of savoiardi (lady finger biscuits) soaked in strong espresso, layered with a mixture of egg yolks, mascarpone, sugar and topped with cocoa powder. But there are also versions with cream cheese (for lower costings, cause mascarpone so freak expensive here), and with normal sponge cakes instead of savoiardi. But it’s totally understandable to change the ingredients and substitute with something else. Its innovative, or just trying to cut costs.. I dug out a recipe from Bo Friberg’s The Professional Pastry Chef book, for both the savoiardi and mascarpone filling and modified it a little. 2. Whip egg yolks and 1/3 of the sugar at high speed until light and creamy. 4. Combine the remaining sugar and the cornstarch. Gradually add this to the egg white mixture and whip to stiff peaks. 5. 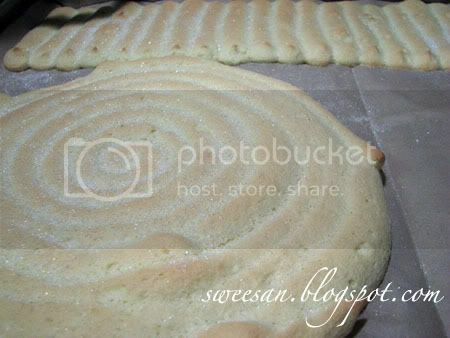 Fold in the reserved egg yolk and sugar mixture, and then fold i the sifted flour. 6. 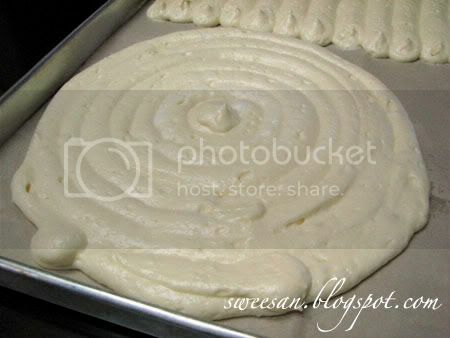 Place batter in a pastry bag with 10mm round tip. Pipe batter into desired shape. 7. Bake at 220 C for about 6-8 minutes or until golden brown. Once removed from oven, sprinkle some caster sugar on baked ladyfinges to retain moisture. I’m making a cake, rather than a free form tiramisu, so I made 2x 9″ round, for base and the center. For the sides, I piped about 4″ for the height, together instead of the individual ladyfingers. As to how much to pipe, it depends on the perimeter of your cake. If the pan can’t fit, join them in the ring later. This is baked, I sprinkled some caster sugar to retain the moisture of the ladyfingers. Leave it aside to cool while you prepare the mascarpone filling. 2. Combine egg yolks, sugar and remaining liqueur in a bowl. Set over bain marie and whisk constantly till the mixture has thicken to sabayon consistency (Thick, creamy and coats the back of wooden spoon like soup). 3. Remove from heat and continue to whip at medium speed till cool to touch. Refrigerate. 4. Whip whipping cream to stiff peaks. Reserve. 5. Mix mascarpone and cream cheese, beat till lump free. Add in egg mixture to it, followed by whipped cream. Heat the gelatin mixture to dissolve. Quickly stir the gelatin into a small portion of the cream mixture to temper. Still working rapidly, add this to the remaining mixture. Use immediately. 1. Set a ring mould to 9inches. Line the ladyfingers around the side to form a wall; kindathing. Place a base into it. If it doesn’t fit, cut the edges. 2.Brush strong coffee over the base and pour in half of mascarpone filling. Sift cocoa powder over the filling. 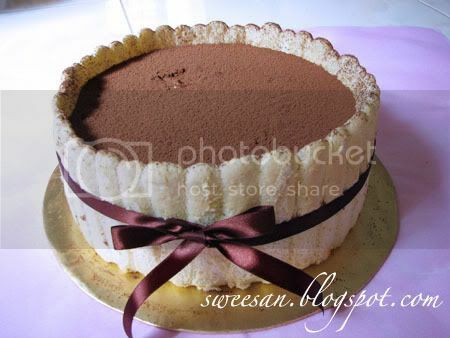 3.Top with another layer of ladyfinger sponge, brush with strong coffee. Pour in the rest of filling and put in refrigerator to set for about 4 hours. 4. Before serving, remove the ring mould and sift more cocoa powder on top. Wah looks good. Didn't know there is a recipe for Savoiardi. I just bought my tiramisu ingredients. Will be tackling my first tiramisu soon. Ya mascarpone so expensive. Hello,may I know how do you make the strong coffee that is used to brush on top of the lady finger?